The MFC-7340 is a compact and affordable laser all-in-one suitable for your home office or small business. 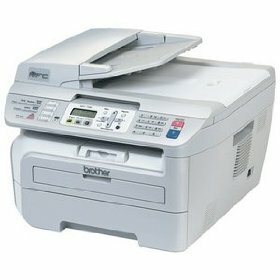 It combines high-quality monochrome laser printing, copying, color scanning and faxing in one compact unit. Use the document glass for copying, scanning or faxing a single page or the 35-page capacity auto document feeder for multi-page documents (up to legal-size). It also has a USB interface for local connectivity, and can even be used as a stand-alone device for copying and faxing without being connected to a coumputer. Fast printing and copying. Print and copy speeds of up to 21 pages per minute. High-quality laser output. Produce crisp, rich black output up to 2400 x 600 dpi print resolution. 35-page capacity auto document feeder. A quick and easy way to copy, fax or scan multi-page documents. Flexible paper handling. 250-sheet capacity paper tray adjustable for letter or legal size paper. Plus, a single-sheet manual bypass for envelopes, labels or other types of media. Flatbed color scanning. Use the document glass to scan pages directly to your E-mail application or to a single PDF file using the auto document feeder. Fold-out rear output tray. Opening the printer's rear exit allows for a straight-through paper path and is ideal when using the single-sheet bypass slot for printing envelopes or thicker media. USB interface. Connect the all-in-one to your computer for printing, scanning and PC faxing.